Yesterday we attended a course run by Dutch company Repair care International. Repair care allows for repairs to be made to windows, doors, fascias...well pretty much any exterior joinery and woodwork, as well as bricks, slate and even cast iron! It can be used as a preventative to rot by closing up ends of timber and is a much better alternative to splicing in new wood or traditional powdered and two pack filler repairs. Although quite an expensive system to use, it makes more permanent repairs and is a lot cheaper than window replacement, with less upheaval (most repairs can be made in situe). Companies such as the national trust use the system to maintain their properties and preserve the original joinery of their buildings. So what does the course cover? Lots of examples of use are shown and discussed, along with pictures and videos of real case studies. The causes and preventative measures of rot and other failures such as paint breakdown are shown and discussed. They teach you how to use the product itself, as well as how to remove the old rotten wood and what the differences are between the various types and even let you try out some of the repair methods for yourself. The course also covers aspects such as costing the material and how to make a full inspection and assessment of a job. It was well worth attending the course and trying out the product for yourself, they can even guarantee work completed after the course has been attended. The course lasts around 6 hours and even includes lunch and refreshments! Many thanks to Repair care international for providing the course and to Swindon's Colour centre for hosting the event. Today I made a visit to Benjamin Moore's UK base in Slough with fellow decorator Curtis Fry. Craig and his team, his wife Helen and Ian, were very accommodating, with a bacon roll and tea shortly after arrival! They were more than happy to answer all our questions and to let us try out any paints and finishes we chose too. They even let us try out the rollers and brushes from Benjamin Moore's own range, one of which is currently not available to buy in the UK. Here's a little of what we got up to. We really pushed things to the limit, probably giving BM a bit of a hard time! We started out by trying the advanced primer over a couple of old woodstained doors, application was great, though there were signs of a couple of more stuborn 'stains' bleeding through. We left these to dry with a heater on them for around an hour before trying a scratch test, which you can see below. This is way below the recommended re-coat time and as with all water based products would usually need a few days to harden off. As you can see though, its already pretty tough after just a short period. Next the Aura scrub test. On 2 patches previously painted by the Benjamin Moore team we scrubbed very firmly but no colour came off onto the cloth at all! This is definitely a plus, however once dried there was still signs of smears where it had been wiped. Next we tried out some coverage tests. We tried various combinations of colours and finishes, 2 of which you can see videos of below. The coverage is on another level to anything else and covers extremely well in 1 coat, so I would see no issue in applying just 2 coats of any colour, even with pale colours over dark ones. Overall it was a great visit allowing us to try the whole range and discuss the finishes and benefits of each. Well worth a visit if you get the chance, just allow plenty of time. We were there for around 4 hours! They have an extremely good knowledge of the whole range of products and were able to answer anything we threw at them. Many thanks to Craig and co. for extending the invite to us and for taking time out of their busy schedules to accommodate us. We even came away with a few gifts, which will come in handy! Benjamin Moore make some pretty big claims about their Aura matte paint. They are wipe-able, mould resistant, have a recoat time of just 1 hour and cover in no more than 2 coats, no matter what the colour! I have to say that I owe Craig Shaw, of Shaw paints, the UK distributor of Benjamin Moore paints, an apology. I didn't believe him. These are big claims and speaking direct he does have the knowledge of the products to back it up. I think my problem is that so many manufacturers make big claims, but in practice the products don't live up to the hype. So in order to find out for sure, I ordered some Aura Matte to trial at home and here's what I found. The test was over yellow emulsion. The colour of choice was called Normandy, a lovely blue/grey colour. Blue on yellow and vice versa are a known problem for coverage - along with reds. I applied the paint using the fox paint brush from Mypaintbrush and a hamilton long pile roller sleeve. I couldn't believe my eyes, cutting in and rolling. Below is a video of rolling out a wall. I have to admit, I applied the paint a little too heavily on this first section, I later on spread the paint much further. Covering a wall 6.88 sq metres in 1 dip of the roller! As you can see from the video the coverage excels all expectations - you could potentially get away with just one coat! I can't obviously comment on the mould resistance or long term durability of the paint, but can say that although a 1 hour re coat is claimed, the paint is still wet in the corners 2 hours later. Another thing I notice is that the paint did run in a couple of places, so perhaps I had applied the paint too heavily, though it was applied how I would normally apply any emulsion, perhaps due to coverage this needs to be spread further? The filler didn't flash, I got a nice even finish, without too much shine, ,which is associated with many wipe-able finishes. After the first coat there is no boxing around the cutting in areas, just a nice even finish. On the first coat I managed to cover around 26.58 sq metres total area in around a quarter of a tin. The paint cost me £57.60 for a U.S. gallon (3.78L). Although at the upper end of paint prices I'd say this is good value for money. It goes a very long way and for the time saved on recoating is well worth it. This paint is potentially everything that it is hyped up to be, putting me in mind, yet again of how paint in the UK used to be. This paint is a joy to apply and I can't praise it enough. Its a very exciting time to be in the decorating industry at the moment and I can only thank Craig Shaw and his team for bringing these excellent paints to our shores. Having now applied my second coat I just wanted to add a few comments. The paint does seem to separate very quickly. Here are some pictures of it when I opened the tin to second coat and then shortly after using it in my scuttle (click images to enlarge). This doesn't seem to effect the finish, but does mean it needs a regular mix up. The finish is outstanding after the second coat. Its very even, with no boxing around the cutting in areas, like you would get with a lot of other brands. It is also quite a matt finish for a wipeable paint. It has a lovely feel to it it once dry and is really nice to work with. The room was approx 2.8 by 2.6 with 1 door and one window. I have used approx 2/3rds of the tin which as mentioned was 3.78L (a U.S. gallon). Through coverage alone and time saved on extra coats with certain colours I don't think this would work out any more expensive than other wipeable finishes and in some cases may even be cheaper. The paint also benefits from mould resistance. Hanging a feature wallpaper in under 15 seconds! You've heard of Jamie Oliver's 15 minute meals, well here is Craig Brooks Painting & Decorating hanging a feature wallpaper in under 15 seconds! Where to make your own website? I know nothing of code so this may be useful to you, but have learnt a little about SEO (via lots of Google searching), which means I appear quite prominently on Google. I started with a vistaprint one, but quickly found it lacked editability when you get to know a few things and some of the things it lacked made it difficult for search engine 'bots' to rank your page. So I moved to 1&1 which was great. Can't fault it as a site builder really, except one thing. Occasionally my site would be down for no reason and wouldn't get much out of them other than we are working on it and should be back tomorrow. I moved from there to Google sites because I had made a site for a local canoe club and found it did what I needed but was FREE! Google sites isn't bad for a freebie. Occasional glitches but nothing major. I'd happily build a site on there again. That was great until everyone started viewing more on mobile devices. Google sites can be set to automatically adjust to a mobile viewing, but its not great at it. So that leads to the one I have now which is built on Squarespace. I listen to a lot of podcasts and anyone else that does I'm sure will have heard of Squarespace, as they sponsor a lot. There are often discount codes available via these podcasts. Very easy drop and drag system. Not too expensive and most importantly automatically adjusts for mobile viewing. They are actually used by quite a few major brands now. Can't think who off the top of my head but I know Scroobius Pip does, so check his site out as an example. They don't have a massive selection of templates, but what they have is very good. They also have 24/7 help. I think the main thing to remember wherever you build is to keep it simple and always use black text on a white, or pale background. This makes it easy to read. coloured text and background may look good but is hard for some people to read. If you haven't heard of the name Benjamin Moore yet I'm sure the name will soon become familiar to you. There is a lot of fuss being made as more and more UK decorators switch to Benjamin Moore, it seems to be all my Twitter feed is full of lately, its becoming more like a Benjamin Moore forum! Benjamin Moore may have only recently been launched in the UK, by Craig Shaw, but are a well trusted and established name in America and Canada. I have already switched to their ceiling paint for most of my work as it has an unrivaled finish for ceilings. Its like UK paints used to be before they started messing with formulas. No flashing or lap marks just a beautiful flat finish. I recently got sent a tin of each of the advanced satin and the advanced gloss for free for winning a Twitter competition and thought it would make a great opportunity to test these products for myself. I have heard people saying that its like oil based paint used to be before 2010, when the EU regulation changed and all paint took a sever downturn. But I have to disagree with this statement. It is nothing like oil based used to be, its far, far superior! Its a dream to apply and levels beautifully. It doesn't have the horrid odour or drying time that oil based has either, nor will it go yellow several months down the line. Another advantage is in some circumstances it doesn't even need an undercoat and will cover even the most yellow woodwork in 2 coats! My first trial was on an off cut of oak veneer. It adhered well even after just one day, which can be an issue with some water-based finishes. My main surprise was the sheen to the gloss. Very often water-based gloss' are not as shiny as the traditional oil finishes and it becomes a compromise over using oils that will yellow. This is not the case with this stuff. You can see in the image below that held next to a window sill finished in a traditional oil gloss there doesn't appear any difference to the sheen. The bottom sample is the Benjamin Moore finish and even makes the top gloss look yellow (which is only 5 months old and wasn't painted by me). I have since been using it at home on some woodwork and it is just phenomenal! I can't praise it enough. It will definitely be my go-to finish for woodwork from now on. This yet again is showing the lack of quality when it comes to UK brands, which most decorators have lost faith in the reliability of. No brand even comes close to this. I can see BM becoming a very big UK brand before long. This question was put to me last week. Whilst there are some good UK products, it is true that a large amount come from the U.S. I realise its a general statement and there are some good UK and Europe products out there. But I'd say a lot are very recent and we are still catching up with the U.S.
Its taken me a while, but I think I've worked it out. I'm thinking of paint here. When it comes to tools the U.S made products just seem to be superior :-) Although with recent brands in the UK, like Axis and the fox brushes, there is competition out there. In the UK paint manufacturers are constantly adapting products and re-releasing them as 'new improved formulas'. This was really noticeable after the the 2010 EU regulation changes. Ever since then the paint has gone downhill; I'm sure lots of people will be aware of the yellowing gloss problem. Its been a constant battle for decorators, trying new products and ' improved formulas' and getting over various difficulties that have arisen. The main difference in the U.S. is that their paints are made from scratch, made for a purpose and are not just re-adapted versions of old products like they are here in the UK. whereas a lot of UK brands are just new versions of old formulas to either 'improve it' or to have met the EU regulations, rather than bringing out a good product and sticking with it. The U.S are leading the way with water based, environmentally friendly, paints. With brands like Mythic and Benjamin Moore, the competition is very high. UK manufacturers need to open their eyes and pay attention, especially to the trade, who are often ignored by big companies like Dulux and Crown who pass the blame of a problem onto the way the decorator did the job rather than addressing the issues with their products. I have seen this happen time and time again with myself and other decorators. I have heard recently that Dulux have a fantastic water based exterior satin in New Zealand, but not here. I have also heard that the reason for not releasing these great products here is because they are still making a profit from the sale of older oil based paints. If that's the case then the problem lies with decorators not keeping up with advances and sticking with 'what they know'. One of the most important things I have found in my career is that you need to change and adapt as newer, better methods become available to you. Much of what I do now is nothing like the work I was doing as an apprentice - and this is for the better! Who doesn't want less dust and a higher quality, longer lasting finish? A few years back I was given the task of making some dark brown, almost black, beams look a lot lighter, to fit in with the rest of the woodwork, which was oak. How to cut in, like a pro! 3M Scotch blue tape causes cancer or birth defects? I notice on Amazon.com it comes with a California proposition 65 warning, but in the UK it has no special warnings anywhere. I have no idea what it is in the tape that could cause any problems, but have emailed 3M in the UK to ask them what its all about. I will add to this blog if and when I get answers. I ended up phoning them, due to a lack of response on at least 4 occasions! Firstly I must apologise for the totally unacceptable response time to your request dated December 19th 2015. We take all customer enquiries very seriously and I can only assume that with the holiday period and employee absences, your email was not responded to – my sincerest apologies once again. Thank you for bringing to our attention the Proposition 65 warning placed on the ScotchBlue™ Tapes on Amazon.com. I have reached out to our US colleagues multiple times to try and find out why the product has been classified as such as we have been informed that Amazon do, on occasion, categorise products incorrectly. I have chased them as a matter of urgency on this matter this afternoon and will update you accordingly. The ScotchBlue™ range of tapes are tested to be safe for use and there has been no connection to birth defects or carcinogens due to the extremely low level of chemicals included in the product. ScotchBlue™ Tapes: when used under reasonable conditions and in accordance with the 3M directions for use, should not present a health hazard. However, use or processing of the product in a manner not in accordance with the product's directions for use may affect the performance of the product and may present potential health and safety hazards. POTENTIAL HEALTH EFFECTS Eye Contact: Mechanical eye irritation: Signs/symptoms may include pain, redness, tearing and corneal abrasion. Skin Contact: Mechanical Skin irritation: Signs/symptoms may include abrasion, redness, pain, and itching. Inhalation: No health effects are expected. Ingestion: No health effects are expected. I attach the Material Safety Data Sheet for the product which details any potential health effects associated with the product. This is a legal requirement and is available for public viewing on www.3m.com. Once again, thank you for bringing this to our attention, I will ensure that my American colleagues work to amend this listing with Amazon to prevent any future concerns. We have had discussions with 3M in the US and we are able to confirm to you that there should not be a Prop 65 cancer statement for this 2090 product – 70006576493 - on Amazon Website. This is being updated with the 3M team in US and working with the update with the Amazon team. Hope this information will reassure you whilst using 2090 Masking Tape. As the year draws to a close, and I am on my last couple of jobs for the year, I thought it would be nice to look back at the year that was. As usual its been a very busy year. Looking back at the jobs I have done, this is the first year without using any oil based finishes on interior work, and only a couple of times on exteriors. This is a great achievement. Not only is it better for the environment, but also for mine and my customers health. I've been able to achieve this due to some great, little known products, that are on the market. Bedec aqua advanced satin/gloss has been used a lot, and more recently, Mythic black label satin. I am currently looking into another brand called Benjamin Moore, recently launched in the UK. They are well known in the U.S. for being a quality product, and from my first tests throw all competition out of the water. I have continued to use my sander and dust extractor with great success again this year, resulting in less dust around peoples houses and a higher quality finish. In the new year I hope to upgrade my extractor to improve this service. If you have been a customer this year or in the past, thank you for your custom and I hope to continue to produce work that keeps my customers coming back and recommending me to their friends and families. This year I have worked for over 40 new and repeat clients. Last year I was assessed by Dulux to become a select member and Government trustmark registered. Whilst at the time this seemed like a good idea, with hindsight I'm not sure it was worth it. It was nice to have my work assessed and approved though! As of mid May my membership is due for renewal and I have known since last year that I didn't intend to renew it. This week having had several reminders I decided to let them know. I figure now is a good time to explain my reasons. The first thing is the cost, its over £300 if you include government trustmark. Trustmark was actually the thing I wanted in the beginning, but you can only get it through certain trade associations. Its worth noting at this stage that anyone that works for me has to be assessed by Dulux too - even apprentices. As soon as I became a member I became worried, it felt like I was to push Dulux's name as much as, if not more than my own. This didn't feel right, I wasn't employed by them and I'd taken a long time to build up my business and customer base to what it was and was now expected to use what I'd done to promote them using all their stationary - and pay for that privilege! I didn't want to lose my identity, so limited my use of their materials. They promised to guarantee my work for me as long as it was done with their products (though it later turned out excluded Dulux's own retail products, for which I was never satisfied with their answer for). The problem with this is that I never use Dulux products for all parts of a job, as there are better products out there. I explained this to them and was expected to get customers to sign a waiver form against the guarantee whenever this happened (which is every job). I have never done this as I felt that it came across as unprofessional. I've always offered a guarantee because I trust my workmanship and use products that will last, but because they aren't Dulux I won't guarantee it? No, this isn't right, I choose the right product for the job because I want to put my name to it. But the main reason I have chosen to leave Dulux select is because I am increasingly losing my trust in Dulux products. Its not that they don't have good products on the market, just that there is usually a product that does a better job. As a business I want to use the best products for a job - after all the blurb on my home page says 'All work is completed to a high standard using the best quality tools and materials'. I always cringe when I go to quote for a job and I'm asked what I would recommend and have to give the "I know I'm a Dulux approved decorator but I'd go for brand XYZ' - how can I be a good decorator, if I'm recommended by a brand that I don't trust? I'm sure there are more reasons, as I say this has been building up for a while. Hopefully my reasons make sense. I'm still offering the same service and materials on my jobs, just without paying to promote Dulux along the way. I have been asked several times this week about which paint to use for a particular job. I have also had several conversations recently as to why I won't generally use anything but Trade paint. In one instance a customer was complaining about how many coats they had used to paint a room white that was previously green (5 or 6 coats later they still think they can see the green). My first question was 'what paint did you use'. It turned out it was Dulux's retail paint (the stuff you find in Homebase and B&Q) and the customer had no idea there was more than one Dulux - and why would they? All the adverts on TV and the billboards show the logo for the retail paint. I have blogged before about the difference between trade paint and DIY paint - and not just the likes of B&Q own brand, but also brands like Dulux & Crown. Most people don't seem to realise there are 2 main paints made by these companies and its more of a difference than just a logo. One main difference is the pigment used and this is one of the things that give you good coverage and thus requires less coats of paint. The other thing to mention is that in trade paint there is no 'Kitchen & Bathroom' paint. Most of these names are made up for the DIY market and aren't necessary. I'd also stay clear of any 'one coat' or 'once' paint - They rarely are one coat (at least if you want a good finish) and I certainly don't recommend skipping an undercoat when glossing. If you really want to use just one coat and the woodwork is in OK condition try using a satin finish, as this is self undercoating. I have also complained to Dulux select who guarantee my work if done with their products, but won't guarantee their 'retail' paint. I suggested then that it was because it was sub standard, which they denied. They said it was just that the retail paint was formulated for amateur to use, whereas tradespeople know the best products for the job (and that trade paint sometimes requires easing/thinning down to your requirements before use, depending on the job). So what follows is a brief guide to the main paint finishes and where and why to use them, in all cases these are trade paints. I have also been asked if more expensive paints are worth it (trade is more expensive). The answer is simply yes. Would you rather apply 2 coats of trade paint or 5 - 6 coats of DIY paint? I'm sure you have better things to be doing than painting the same walls over and over.! Diamond matt (Dulux) & clean extreme matt (Crown) - a highly durable, wipeable finish. Good for high traffic areas like hallways and Childrens rooms or Kitchens. Slightly shinier than a vinyl matt. Satin/eggshell/gloss - All woodwork areas. Oil based versions tend to go yellow, smell and take ages to dry. Water based will not yellow and dries quickly. More care is needed when applying water based paint onto old paintwork, as adhesion can be an issue, depending on the paint used. Zinsser Perma-white is one example of a paint that can go over old gloss, however it does take 7-10 days to fully adhere - before this it can easily be scratched off. If in doubt priming woodwork with Zinsser coverstain before top coating can help - this primer is oil based but doesn't react to waterbased top coats and dries in an hr! (though it smells pretty strong). We currently use a brand called Bedec aqua advanced on most jobs and this adheres well to old paint work, it just requires a few days to fully cure and adhere. The first stage is to give yourself something to fix a new piece of plasterboard too. 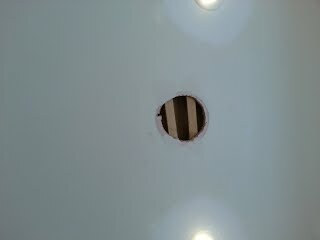 I have just used some old pieces of wood, which I've screwed into place either side of the hole with plasterboard screws, that have been sunk slightly into the surface. Next you'll need to draw a template onto your plasterboard that's the same size and shape as the hole. In this case my hole happens to be the same shape andalmost the same size as a 1L tin of paint (its actually about 1mm smaller than the tin). Cut the shape out using a plasterboard saw. If the shape is square you can use a straight edge and trimming knife. Apply 2 - 3 coats of filler (I use easi-fill). Make sure you allow each coat to dry fully before applying the next. Its best to apply several thin layers, rather than one really think one. It'll dry quicker and sand out nicer. The final stage is to sand the filler and apply your emulsion. In a previous blog I wrote about why Dulux select don't guarantee work completed with retail products. I won't go into detail now, but you can read that post here. A while ago I did a job where the customer wanted to do some of the work themselves. They decided to strip the wallpaper and paint the doors and I would finish off everything else. 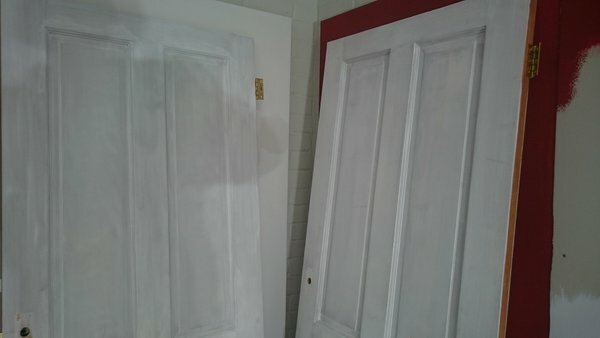 They had their bits done before I started and had sanded and primed the doors with Zinsser B.I.N, which were previously dark stained grained doors, followed by an undercoat (not sure which) and top coated in 2 coats of Dulux retail satinwood, so bringing the total to 4 coats of paint. When it was my turn on the frames I sanded them, coated them in Zinsser B.I.N primer and followed this with a coat of Zinsser cover stain. Next, I put one coat of the required colour, but instead of using Dulux retail I used Dulux trade diamond satin. At this point it already looked much better than the retail painted doors, which had had 4 coats of paint - I was only on the 3rd. I did put a 4th coat on, but before I did I took a picture. I think the Trade version wins, right? There is a reason trade paint costs more, its not just marketing. Yes you can put more coats on of retail and spend less, but this takes a lot longer - this Hallway had around 13 doors. If you were paying a professional they will charge you for the extra coats, so its actually cheaper to buy the more expensive paints. If you are doing the job yourself you can save money on paint, but you'll end up spending all your free time repainting things unnecessarily! In my recent purchase from www.mypaintbrush.co.uk I recevied a bonus item - a 2" fox paintbrush. So this afternoon I gave it a quick trial. Its shorter haired than the brushes I usually use, kind of reminding me of my apprentice days when all I was given to use was a Hamilton perfection. The shorter hairs making it a bit stiffer than other brushes. Next for proper cutting in - around lights. The brush formed a very nice cutting in edge and so had no issues. With ceilings done I decided to continue using the brush on the walls. I found it was quick to work with when fully loaded and it spread the paint with ease, I did lose one more hair at this point too. Cutting in around the ceiling I found it formed a nice cutting in edge again, but perhaps felt a little rounded for me. Overall a very good brush. DIYer's can't go wrong for the price and pro's would definitely find plenty of use for it. They are bringing out more sizes soon and I think a 3" would fly through cutting in, but I'd stick to my usual's for getting those crisp cutting in lines and use this for ceilings and round skirting boards etc. It takes time to get used to a new brush and I will continue to use it. Next week I'll try using it on trim with waterbased satin and see how that goes. - Used this brush again today on walls, ceilings and woodwork (Zinsser perma-white). Have to say it excelled in the woodwork area! Spreads the paint out with ease, better than my trusty Purdys. Layed off nice too. Cutting in was good, but I still think a less chunky, thinner tipped brush would be better. I think having a combo of The fox with a smaller Purdy for cutting in would work really well. It may be that it just needs more time to work in, like the older brushes did. Time will tell! I pretty much only use the fox now for everything. Its a fantastic brush and the range is still growing to include laying off brushes and silver foxes, along with wallpaper brushes etc too. It did take getting used to, but doesn't everything? I purchased Krud Kutter after reading a lot online from people who use it for all kinds of jobs. In the decorating industry it seems to be used as a degreaser before painting (especially Kitchen units) and removing wallpaper paste residue from walls. But what caught my interest the most is the claim that it could be used to remove Zinsser B.I.N. primer from brushes. If you don't know this is a multi purpose, shellac based primer that sticks to a wide variety of problem surfaces. The downside is clean up. It dries very rapidly, even as you apply it! Generally I'd use Methylated spirit to clean the brush after use, but this is nasty smelly stuff - not good for you or the environment and needs special care with disposal of waste material. So I ordered a large container of Krud Kutter original from www.mypaintbrush.co.uk and figured I'd give it a go. Whilst waiting for it to arrive I saw the perfect test for it. I used B.I.N. primer on a job and wrapped the brush up in a plastic bag to await my order. Problem is I was so busy I forgot about the brush in the back of the van for a few days! When I finally spotted the brush in the van I whipped it out and grabbed the Krud Kutter. I put a small amount in a bucket, gave the brush a good dunk and went off for 5 minutes for a cuppa. On return I gave it a few more dunks and couldn't believe it, it had worked! I gave it a wipe with a sponge and a rinse in the sink and was done. It seemed to have cleaned it better than Methylated spirit and smelled a lot better. I think perhaps a longer soak or a secondary clean may have cleaned off more of the dry paint from the stock and handle. I do usually change meths 3 or 4 times on a cleaning job, so for one lot of Krud Kutter it had done a great job. Perhaps the only downside was the cost, with delivery it was £25.93 for 3.79L - but if I'd placed a bigger order I could have got free delivery, making it £16.66. This works out at £4.39 a litre making it cheaper than buying Meths from Brewers and a whole lot better for the environment. I haven't had a chance to try it on anything else yet, but if it can clean off half dried shellac paint from a brush, anything else should be a breeze! Any artex pre 2000 can contain asbestos. If left alone and just repainted it isn't a problem, but if you decide to remove or skim over the artex or do anything that requires scrapping, sanding or drilling, such as fit new lights, it will probably need to be tested first, for yours and your family's safety as well as the person carrying out the job. There are companies who can do this for you, by removing a few small samples and testing it in a lab. There are many companies that will not tell you about this before commencing a job, whether through lack of knowledge or just ignoring the facts. Don't put yourself at risk. It should be said that the risk from asbestos associated with artex is minimal, but care still needs to be taken. Why don't Dulux select guarantee their own products? Some time back I posted on my Facebook wall that Dulux Select will not guarantee work by their members completed with Dulux retail paints (meaning Dulux paint from Homebase etc). My personal opinion was that the retail paint is an inferior product, I do not use it myself mainly due to the fact that it contains less pigment and so does not cover as well as the trade paints (I usually end up applying a few more coats than Trade, depending on the colour). Though for the record I don't use that many Dulux trade products either, as I think there are better products out there, buts that's another matter. However I was under the impression when I joined Dulux select that they guaranteed my work, as long as it was completed with Akzo nobel products. I asked on many occasions, even in person during my assessment about using other brands, which they said would be OK, just not guaranteed by them - never was it mentioned that Dulux retail wasn't covered. I contacted Dulux Select - who didn't seem to know why they don't cover it - only that its in the Select members terms and conditions. So they forwarded my question to Akzo nobel. 'The scheme has always advocated the use of trade paints, on the premise that tradespeople would know the best products to use for the job. Personally I still do not think that this really answers the question. I think that the whole thing, excuse the pun, paints Dulux in a bad light. The Dulux retail colour books all advertise the use of Dulux select decorators, as does the website. Yet members can't choose to use those products without the customer losing their guarantee. So it still leaves the question - why won't Dulux guarantee one of there own products?